My experience in the dog world started over forty years ago with Cavalier King Charles spaniels and then Large Munsterlanders which I had the honor to judge this breed at Crufts in 2005. I first awarded challengers in the late 1980's in the UK and during that time we also owned a GSP! GWP and an Irish Water spaniel. When we came down to NZ we brought down with us a chocolate Labrador and the last of our Munsterlanders but we did not show either of them. When I got back into the dog showing world we had a Goldie and another Irish water Spaniel. We then got into Clumber spaniels which we had for nearly ten years we now have Border Terriers and Norwich Terriers including one we have imported from the famous Ragus kennels in the UK. 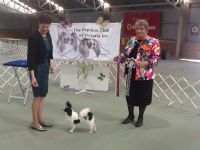 During my judging career down under I have judged both the Clumber speciality and the Papillon speciality in Australia and the GSP Speciality in New Zealand as well as gundog and toy groups in both countries. I now have groups one, two ,three and four at championship level as well as junior showmanship and look forward to many more years of judging in both of Australia and New Zealand.